We have received reports that a number of VPN services and Tor have been blocked in Venezuela over the last few months. This includes TunnelBear, Windscribe, and Opera VPN. These blocks are clearly intended to prevent citizens from evading increasing state censorship. This includes shutting down criticism of President Nicolás Maduro by local news media outlets, plus blocking access to YouTube and Google Translate. In March 2019 a huge power outage caused 96 percent of the country’s telecommunications infrastructure to cease working. This resulted in the entire internet and all mobile phone networks in Venezuela going offline, leaving many ordinary people without the means to stay in contact friends or family or access vital news and information. There is nothing that ordinary people can do if the entire internet is shut down. Satellite phones allow communication even during a complete infrastructure collapse, but these are very expensive. As long as the internet is working, however, there are measures you can take to access blocked websites. Unless a VPN service or app is itself blocked, using a VPN connected to a server outside Venezuela will unblock all websites for users in Venezuela. If a VPN app is blocked, then the simplest solution is to try another one. We have only heard of three VPN services being blocked, all of which are free. The desire to use a free VPN is understandable given the current economic crisis in the country, which is why these services have been targeted. If no free services works, then it is worth trying a cheap VPN. No Venezuelan Internet provider (ISP) has advanced deep packet inspection capabilities to detect VPN use, so the blocks used are very simple ones. The ISPs just blacklist IP addresses known to belong to VPN services. 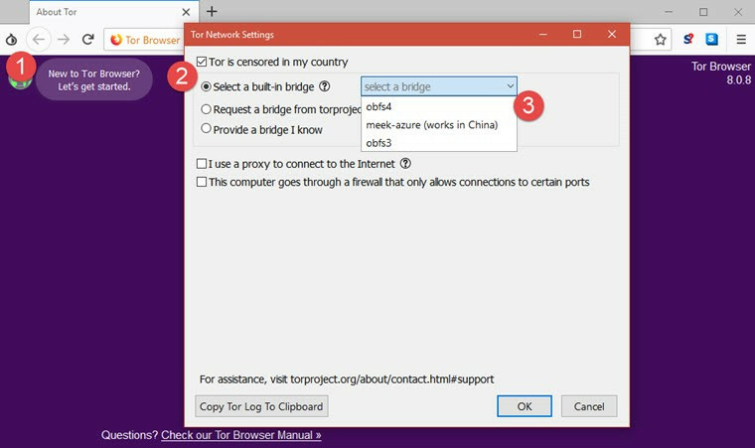 Reports indicate that access to regular Tor is occasionally blocked, but Tor Browser comes with a built-in anti-censorship capabilities called pluggable transports. Using these should enable you to access Tor even when it is blocked. In Tor Browser click on the Tor onion icon -> Tor Network Settings. Tick the “Tor is censored in my country” checkbox. Select a built-in bridge. If one doesn’t work, then try another. If none work then you can request a custom bridge from torproject. Clock “OK” when you are done. If access to the Tor website is blocked, then you should be able to download Tor Browser from a Tor mirror site (perform a web search for these if the official list is censored). Creating your own VPN server on a rented virtual server located somewhere which is not censored is inexpensive and highly effective at defeating censorship of the kind performed by ISPs in Venezuela. This is because ISPs are unlikely to block private IP addresses that are not registered to a VPN service. Doing this from scratch requires some technical ability, but PrivatePackets.io automates the process so that most people should have no trouble setting up and running their own private VPN server.